Memorial to the Big Bottom Massacre, the January 2, 1791 battle between Ohio Company settlers and the Wyandot people. The memorial is located in Morgan County, Ohio. The photograph was taken ca. 1940-1949. After the Revolutionary War (1775-1783), relations between Anglo-American settlers and Tribal Nations shifted from more amicable interactions to varied degrees of tension and conflict due to continued U.S. expansion onto American Indian lands. Regular skirmishes over trespasses between Anglo-American settlers and American Indians characterized their cohabitation in Ohio Country, and after the Revolutionary War, settlers more aggressively pushed American Indians off their land. With the newly founded country drowning in debt from the American Revolution, the federal government enacted the Northwest Ordinance of 1785 which claimed all land north and west of the Ohio River as federal land. Although land ordinances contained articles to protect American Indian lands, these articles were widely ignored. In the Northwest Indian War (1785-1795), also called Little Turtles’ War, a band of tribes led by Little Turtle, chief of the Myaamia nation (Miami), fought against Anglo-American militia to regain control of their lands in the Northwest Territory. Little Turtle led his confederacy to victory in 1790 against General Josiah Harmar at Fort Wayne, Indiana, and later in 1791 against Major General Arthur St. Clair at Fort Recovery, Ohio, in Mercer County. Although tribes in northwestern Ohio were actively combating settlers, tribes in southern Ohio were also being pushed out of their land by Anglo-American settlers traveling north over the Ohio River into Ohio Country. In December 1790, a group of 36 settlers built an Ohio Company blockhouse, and by early January two cabins as well, on the eastern bank of the Muskingum River near present-day Stockport, Ohio, in Morgan County, at a settlement called Big Bottom. The Ohio Company sponsored small settlements around Marietta, including Big Bottom, where settlers would receive land with the expectation that they would improve upon the land in the coming years. However, the land allocated by the Ohio Company for the Big Bottom settlement was land belonging to the American Indian tribes in the area. A major American Indian trail from Sandusky, Ohio, to Muskingum ran just across the river alongside the settlement at Big Bottom. A group of about 25 Wyandotte and Lenape (Delaware) warriors traveling on the trail assessed the settlement and on January 2, 1791, attacked the blockhouse. Twelve to fourteen men, women, and children living at Big Bottom were killed. Although it is unknown whether the warriors were on a sanctioned mission or acted on their own, such violence against settlers was a common and predictable reaction to Anglo-American squatters settling on American Indian lands. Violent outbreaks between settlers and American Indians widely occurred in Kentucky and territories west of Ohio Country. The attack at Big Bottom, however, had an irreversible impact on the strategies utilized by Anglo-American settlers to destroy and claim American Indians’ land rights. After the attack, Big Bottom was abandoned and continuous, violent expeditions against the American Indians to force them off their land ensued until tribes of the Ohio Country were defeated by General Anthony Wayne at the Battle of Fallen Timbers in 1794, ending the Western Confederacy, a united band of tribes who fought against U.S. expansion into Indian Territory. This victory for Anglo-American settlers led to the Treaty of Green Ville in 1795, which was championed as a treaty of friendship between settlers and the American Indians, but forced tribal leaders to relinquish much of their land to Anglo-American settlers. The Treaty did not subdue tension between American Indians and settlers, and tribal leaders continued to fight to regain their lost land as Tecumseh, leader of the Shawnee, formed a new Indian confederacy allied with the British, to oppose U.S. expansion. Today, the Lenape people live in Oklahoma and Canada. According to the Wyandotte tribe’s historical narrative of these events, the Tribe ceded their land in Ohio on March 17, 1842, as the last attempt to save and preserve the culture and people of their tribe, as a traditional war with Anglo-American settlers would have resulted in the destruction of their people. Traditionally, the Wyandotte are considered to be the last tribe west of the Mississippi River to leave Ohio and relocate out west. The site of Big Bottom is memorialized by a 12-foot obelisk marking the site of the attack. 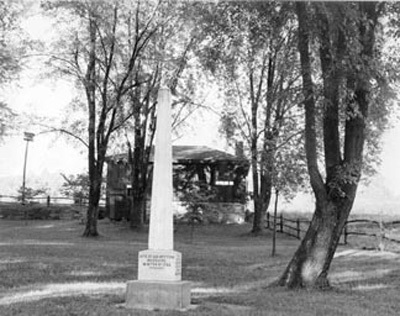 Big Bottom Memorial Park is one of the historic sites co-managed by the Ohio History Connection and local officials. Griffin, Patrick. "Reconsidering the Ideological Origins of Indian Removal: The Case of the Big Bottom Massacre" in The Center of a Great Empire; The Ohio Country in the Early Republic. Athens, Ohio: Ohio University Press, 2005. Simmons, David A. "Big Bottom Massacre." Timeline, December 1991-January 1992, p.42-45.